Whether its shipwrecks, marine life or exotic rock formations, you will find all kinds of spots to go diving in Indonesia. Scuba diving in Indonesia is incredibly special. With one of the most extensive coastlines in the world, stretching from the Pacific Ocean in the west to the Indian Ocean in the east, there are so many options when it comes to scuba diving in this Southeast Asian jewel. You’ll find our Top 15 dive sites below. Set close to Mansuar Island, Raja Ampat; Manta Sandy is a manta cleaning station. The narrow channel is dotted with small coral bommies. Here, divers enjoy a chance to see a group of about 10 giant mantas, waiting majestically in line above the two rocks for the tiny cleaning wrasses to weave their magic as they clean up the parasites, mucus, and bacteria on the manta’s body. Good to know: Divers can get close to the mantas but don’t overdo it as once gone the mantas don’t return for quite some time. 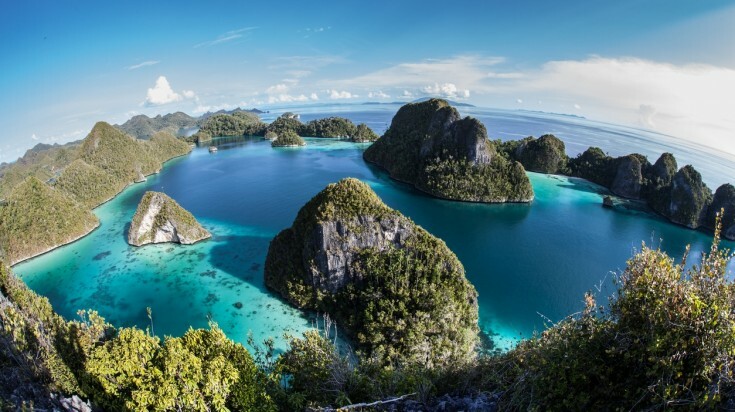 Set just off the northwest tip of Irian Jaya, Raja Ampat or four kings is some of the best diving sites in Indonesia. 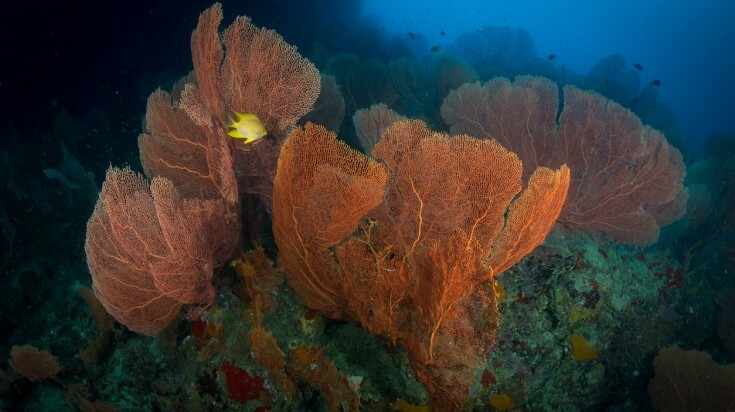 Cape Kri holds the world record for the largest number of species identified in a single dive! Here, in this archipelago of 1,500 small islands, you’ll discover an incredible 1,200 species from sharks and schooling fish to stunning coral gardens. Good to know: Make the most of your dive by grabbing onto a rock and watching the marine parade go past! This four-engine bomber crashed in May 1945. Today, the wreck is covered with soft coral and is home to colonies of shrimp, meandering nudibranchs, lionfish and a massive jackfish school. The reasonably intact wreck lies on a muddy bottom near mangroves. Located north of Sulawesi, the Togian Islands are a remote unexploited group. Most dive sites are within a one-hour boat trip from the island. Good to know: This is a great warm up dive before heading to Una Una, a nearby volcanic island with lava ash sand! Nestling between the Pacific and Indian oceans, Komodo Islands is home to some of the most sublime scuba diving in Indonesia. Diving spots in Komodo offers shallow reefs, vibrant marine life, deep walls, and pinnacles. This dive site is off Nusa Kode, east of Komodo. The distinctive yellow color is due to the yellow sea cucumbers, which almost completely mask this wall, together with soft yellow and orange corals. Good to know: Venture deeper on the wall and divers can spot white-tip reef sharks, green sea turtles, and red snapper. Batu Bolong sits between Komodo Islands and Tatawa Island. Its highlight is a rocky pinnacle 75 meters down. The pinnacle’s walls and crevices are covered in a riot of coral growth and shoals of small reef fish. You’ll also find big pelagic fish, including barracuda, tuna, Napoleon wrasse, giant trevallies and white-tip reef sharks. Hawksbill turtles are also sighted feeding on the wall’s sponges. Good to know: Strong currents can sometimes make diving extremely challenging. Diving is best in the comparative shelter of the pinnacle. 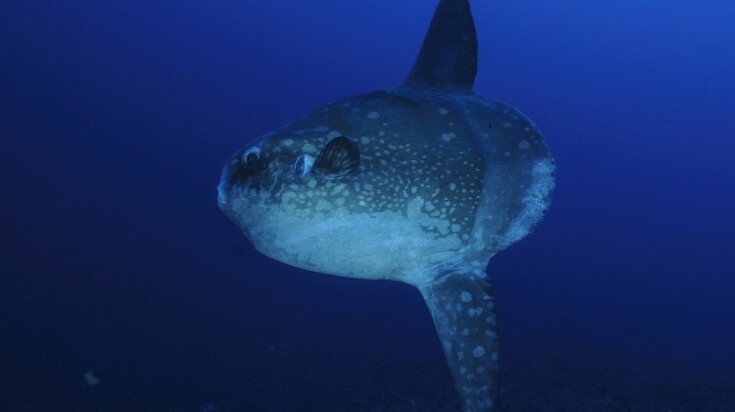 Pristine visibility and regular visits from Mola Mola or ocean sunfish during July to mid-November make Crystal Bay a ‘must dive’ Bali spot. The hard coral reef is covered with anemones and soft corals, while reef denizens include Moorish idols, sweetlips, angelfish, frogfish and Banded sea snakes. Expect to see manta rays, Leopard, Guitar and Wobbegong sharks. A bat cave on the bay’s north side can be entered underwater with divers surfacing to see the bats sleeping overhead. Good to know: On the outer edges of the dive site, the current is super strong and comes with multiple thermoclines. Swimming through the colorful reef fish in Toyapakeh’s partially protected bay. Divers see clouds of batfish, triggerfish, and giant trevallies. Sheltered areas conceal cuttlefish, lionfish, octopus, and lobsters. Toyapakeh is another prime Mola Mola spot during the July to mid-November season together with nurse sharks, barracudas, and big tuna. Good to know: A 5 mm wetsuit is recommended in winter as the water temperature drops to 18°C due to the depth at this site. The Liberty Shipwreck is home to schooling fish, reef sharks and barracuda. The wreck of the 120-meter long USAT Liberty lays just 30 meters offshore at Tulamben, making it one of the world’s easiest wreck dives. Novice divers can dive a world-class wreck, now almost completely sheathed in hydroids, feather-stars, and crinoids. Don't miss the bow gun and its population of pygmy seahorses. Good to know: Being so close to shore, night diving the Liberty Wreck is a memorable experience. The Bunaken Marine Park sprawls over the northern tip of Sulawesi. This world-class wall dive features small caves covered with hard corals, while schools of black snapper, fusilier, drummer, butterfly, and parrot fish call it home. Black and white tip sharks patrol off the wall as turtles feed and you also come across occasional sea snakes. Good to know: This is a wonderful site for macro-photography, so bring your camera! Bounty Wreck in Lombok is home to marine life of all sizes. 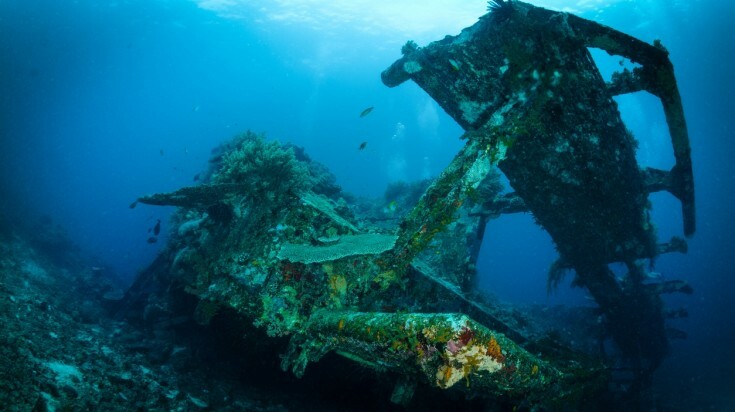 Bounty Wreck is a drift dive, which starts on a long-abandoned 25-meter platform that sank in shallow water. The wreck is home to an insane amount of life, from drummers, snappers, lionfish, scorpionfish and frogfish to nudibranchs. Scuba diving in Mataram offers drift diving, wall diving, and wreck diving. Reefs are covered with abundant corals and a host of marine life including moray eels, angelfish, white-tip reef sharks, and cuttlefish, turtles and ghost pipefish. Good to know: A deeper ridge runs parallel to the shallow slope, making a great place to spot sharks. 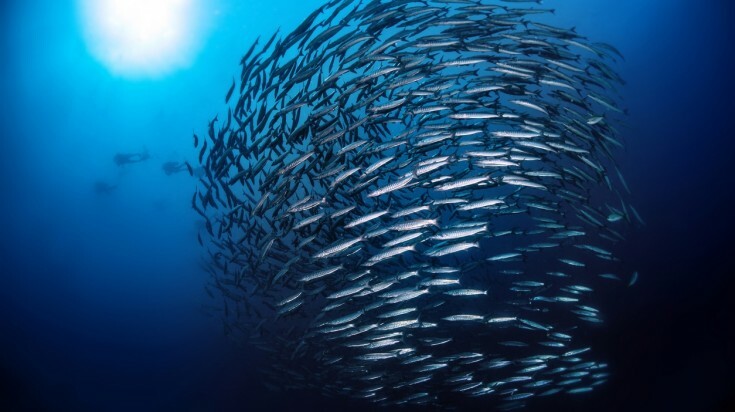 Barracuda Point is a diving spot in Indonesia that delivers! The site, on the reef point close to the jetty, is well known for the ‘tornado’ of swirling barracuda encountered there. Drift with thousands of chevron barracudas, white-tip reef sharks, blue finned tunas, jacks and massive bumphead parrotfish! 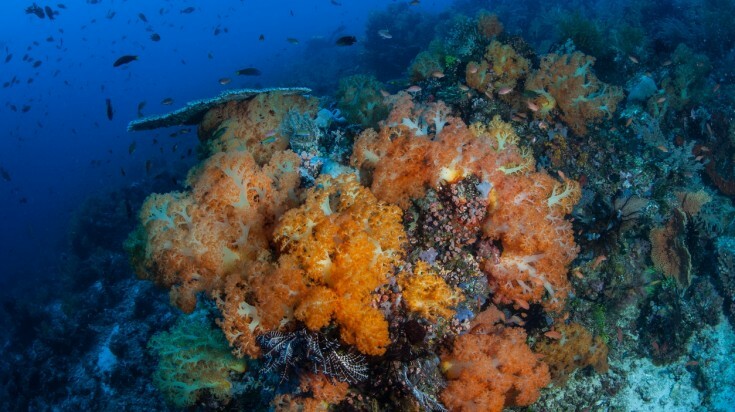 Good to know: After your drift dive finish your dive by exploring the shallow coral garden. 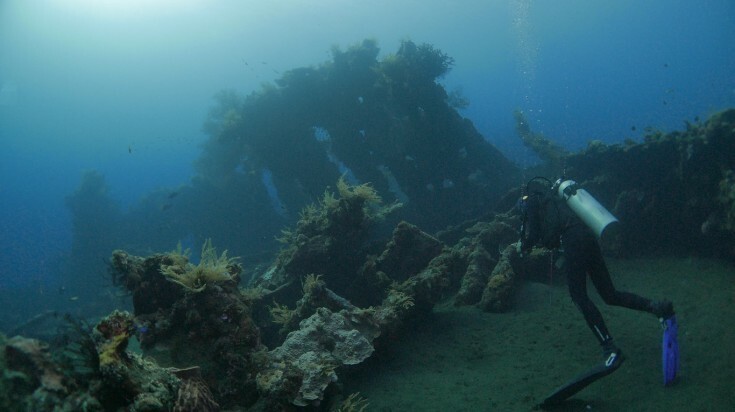 The Gili Raja wreck is a sunken World War vintage cargo ship covered in dense black corals. The wreck is an imposing 90 meters in length and can be penetrated. Marine lift highlights include blue-spotted stingrays, eagle rays, and schools of silversides. Frequently sighted fish include grouper, triggerfish, snapper, angelfish, scorpionfish and moray eels. 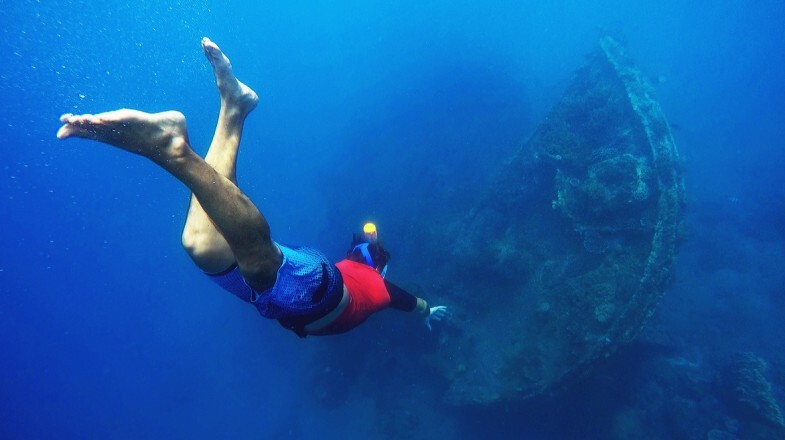 Good to know: Conditions at their best diving the Gili Raja wreck from March to December. Pintu Kota means the 'City Gate' and has stone arches over and under water. Pintu Kota is known also known as ‘Gate of the City’ an hour away from Ambon Harbor. 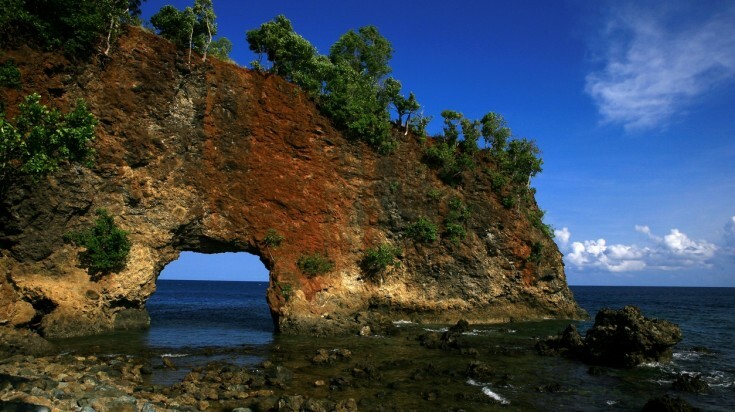 It is named after several natural arches sitting at 17 meters, which resemble mighty underwater gates. Here, divers swim with trevally, fusiliers, jack fish, parrotfish, snapper, grouper, barracuda, puffer fish, sweetlips, gobies and blennies, flounders and moray eels. Good to know: The spot is great for muck diving adventures, snorkeling, and underwater photography. This is the lazy man’s shore dive and one of the world’s best! Just a few fin strokes bring you to a carnival of corals and thriving fish life. Drift along the reef face and exploring its delicate beauty. Home to 25 coral reefs and 900 marine species, frequent guests include sea turtles, moray eels, manta rays, and dolphins. Good to know: At its outer edge, the reef drops abruptly from under two meters to more than 40, allowing multi-level dives and extended bottom times. One of the best-kept secret diving places in Indonesia; Pulau Ai is a top dive site for shark encounters with hammerheads, thresher, and silvertip sharks thanks to its thriving reefs of enormous hard corals, languid sea fans and sponges. Giant trevally, wahoo, chevron barracuda and bluefin trevally hunt here regularly. Good to know: Snorkeling is free in the Banda Islands but it is best to bring your own snorkeling gear as gears may not be easily available. You can go diving in Indonesia all year round. However, it is important to understand the country is vast and weather conditions vary greatly from spot to spot so check the conditions in advance. A general rule of thumb is that the rainy season lasts from November to March with the dry season extending from April to October. The best time to go diving is during the dry season when the visibility is at its best. One exception to this is diving the Komodo islands during the monsoon, as this is Manta season. Bali has its own unique weather patterns and is much less affected by the annual monsoon. Whether expansive sweeps of coral are your passion, or you prefer wrecks, steep drop-offs, deep-water trenches or underwater volcanic mountains, Indonesia’s languid turquoise waters aim to please. With 3,000 species of fish and 600 coral species to discover you’ll find yourself constantly captivated when diving in Indonesia.